The devil is in the detail or so they say. I must have been very bored one day whilst on the old interwebs, or I am the son of Satan. I'd say the former... some may disagree. I managed to pick up a couple of brown leather money pouches from a LARPs seller on fleabay. They weren't expensive and are really well made (they smell wonderful too); they make excellent, atmospheric dice bags. Needless to say, the Parliamentarian player has orange dice, the Royalist player red. I also picked up orange and red arc of fire templates from Warbases, to complete the theme. Rather than having ugly tape measures I plumped for brass and aluminium measuring sticks from Products for Wargamers. Extravagant but lovely. 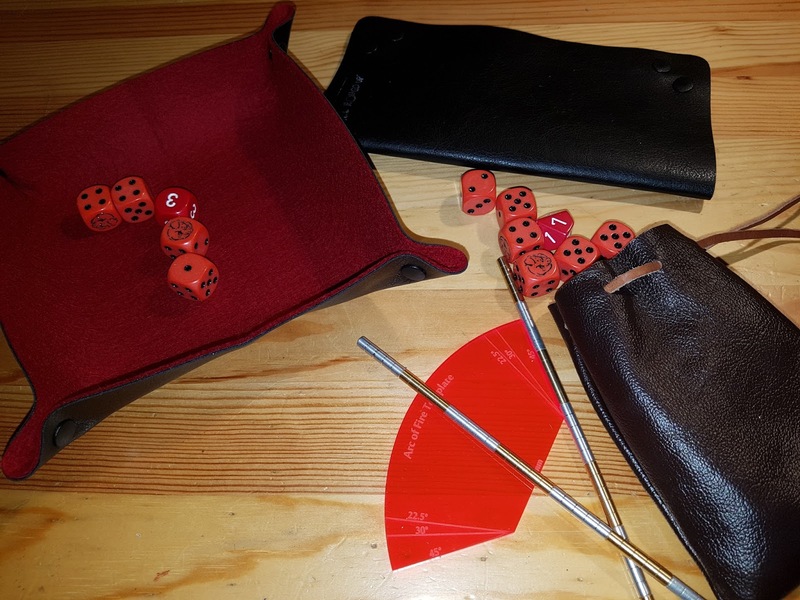 Red and orange felt folding dice trays from All Rolled Up complete my gaming aid sets. If you aren't familiar with All Rolled Up's dice trays, they have a black faux leather outer and a felt inner. A clever combination of poppers allows it to fold flat when not in use, or pinch the corners together to make a dice tray. A wide range of colours available, as well as some patterned neoprene designs.